There's a certain type of managed services provider (MSP) business that has a lot of industry experts concerned these days. This business gets some or all of its revenues from managing small to midsize business (SMB) clients' IT needs. So far, so good. What's been successful for this MSP in the past is a technology model that uses remote monitoring and management and professional services automation tools to monitor desktops, servers and other equipment that sits on the client's premises. The MSP has been billing the client on a per-device basis and may also run a small datacenter consisting of a few racks of servers for off-site backup and recovery and other services on behalf of clients. The biggest red flag in this hypothetical business is a pronounced sluggishness in presenting cloud alternatives to clients. For more on this topic, check out this pre-recorded webcast hosted by RCP Editor in Chief Scott Bekker and RCP columnist Howard M. Cohen. No precise figures are available, but there are several tens of thousands of MSPs in North America alone who fit all or part of that description. The model has worked to varying degrees and with minor adjustments for most of this young century. But there are signs that business as usual with that particular mix may be coming to an end. What most experts we spoke with agree on, as well, is that there's a promising future for managed services defined more broadly, and that companies who can negotiate a few sharp curves related to the cloud in the near term can be part of that future. Cloud services aren't new, and many MSPs have been fending off vendor messaging around transitioning their customers to the cloud without too many ill effects for half a decade now. But the market movement toward cloud is accelerating. "I do think there is an inflection point coming," says Howard M. Cohen, a former MSP and current RCP columnist and channel industry observer. "If you look backward at the progress of cloud, cloud went from being very mysterious to being much more obvious to being clearly the better way to go, and customers are now adopting very fast." The progress has been striking in areas like server sales. Research from market analysts at IDC indicates that much of the growth in server sales comes from the hyper-scale sector -- in other words, the servers designed for the mega-datacenters run by Amazon Web Services Inc. (AWS), Microsoft and Google Inc., which power cloud services. "You can see it in the way the HPs of the world and the IBMs of the world are shifting gears to selling servers and server-class products more like switchmakers sold to telephone companies years ago. They're selling to the big providers. Individual customers aren't buying them up as much," Cohen says. "Customers who have their own equipment are going to be looked at sadly like, 'You still have a server here?' A couple of years from now, I cannot fathom a small or medium business buying an in-house server." "If you look at the pricing strategy, it's very difficult for any company to justify not going to Office 365." ConnectWise software is at the core of many MSPs' existing businesses, and the CEO of the St. Petersburg, Fla.-based company, Arnie Bellini, believes we're witnessing a significant shift right now, spurred by Microsoft Office 365 and, more specifically, by Microsoft's pricing of the suite. "A lot of solutions are going to be moving up into the cloud. The very first one that we see that is of major significance is Office 365. Just the mere fact that Office 365 is floating up into the cloud is going to be the catalyst for the cloud revolution, in my opinion, for our partners and for Microsoft partners," Bellini says. "Microsoft is making it compelling for all small businesses, as well as enterprise businesses, to migrate from on-premises to in the cloud Office 365. They're doing it with their pricing strategy. If you look at the pricing strategy, it's very difficult for any company to justify not going to Office 365. [When it's time to upgrade Exchange], when they do the math of on-premises versus in the cloud," Bellini argues, "Microsoft is making it virtually impossible for you to pick anything but Office 365." Bellini has taken to cautioning ConnectWise MSP partners that if they don't transition their clients to Office 365 soon, they're going to lose those clients to someone else who will lay out the financial math. As a business opportunity, ConnectWise launched CloudConsole to help its partners become Microsoft Cloud Solution Providers (CSPs). Rocco Seyboth, vice president of product and marketing at BitTitan Inc., uses the industry term "born in the cloud" for the group of competitors who are most ready to take that business away from MSPs. "The biggest threat is the born-in-the-cloud guys. They're more nimble, they're not tied into any existing business models or margins," says Seyboth. "The existing guy has a lot to do. Even if they stayed small, a lot of companies with the legacy MSP business model built up really nice revenue streams from their customers. A lot of the products the born-in-the-cloud guys are trying to sell the customer directly conflict with the legacy MSP's revenue streams. The legacy guys can't necessarily do it as quickly as they'd like because they're going to cannibalize their own revenue." Bellini sees heads nodding among his and Microsoft's joint partners at seminars about moving their customers to the cloud, but precious little movement. "They're sitting in the wings and saying, I'll do this when I'm forced to," he says. Cohen sees more MSPs at industry events, who aren't even nodding: "There still seems to be this amazing glut of MSPs that doesn't get that they should move their customers to the cloud before somebody else does." There are legitimate reasons for caution. BitTitan is packaging tools to help IT services companies convert into MSPs and CSPs, and Seyboth says transitioning the sales team to sell cloud is a huge challenge for owners who may have more of a technical than business background. "Not only does cloud represent several new categories of products and services that you need to teach yourself and your sales reps, but then you have to look at how you compensate the sales team. For a lot of these owners, sales is not their core expertise. They may have been lucky enough to hire good sales reps, but when it comes to transitioning paradigms to a new compensation model, that can be difficult," Seyboth says. No one can accuse David Sobel, senior director of partner community and field marketing at LogicNow, of being opposed to change. After all, he was CEO of an MSP business called Evolve Technologies before going to Level Platforms and later LogicNow. But Sobel argues that amid the cloud shift, there is plenty of room for different paces of change. "Never argue with a guy who is doing break-fix or transactional consulting and making 25 percent to 30 percent margins. I don't have the gall to look that guy in the face and say, 'You're not running a good business.'" Sobel also pushes back a little against the dire predictions about a huge washout of MSPs as the industry transitions to the cloud. "Lots of pundits out there will tell you gloom and doom. 'If you don't change, you're going out of business.'" To Sobel, the things that made for great MSPs before cloud services make for great MSPs now. "The top 20 percent have maintained best-in-class margins, have continued to execute consistently, they're seeing stable margins, and they're seeing growth," he says. "A lot of the products the born-in-the-cloud guys are trying to sell the customer directly conflict with the legacy MSP's revenue streams." Rocco Seyboth, Vice President, Product and Marketing, BitTitan Inc. Regardless of the view on whether MSP churn will be higher or not, many observers had similar predictions about what kinds of services MSPs will need to offer to be successful as customers become more enamored of the cloud. There's little debate that cloud services, especially spurred by Office 365 pricing, puts margin pressure on MSPs. Yet there are opportunities of which MSPs are already taking advantage. The major one is finding project work alongside an Exchange to Office 365 migration, Microsoft's efforts to stand up its FastTrack Onboarding Center and service notwithstanding. "Are we putting in Exchange servers? Not really," Sobel says. "But find me a case where an Office 365 project is a zero-sum project, I can't. Migrating, those are nice projects. Linking those services into other servers, nice projects. This inverse between the reality of technology and the way we sell technology has always existed. Find me a technology in the last 30 years that wasn't billed as, 'This is faster, cheaper and will eliminate something else.' You can't. The PC is going to eliminate your mainframe. The LAN is going to move everything into the network instead of the PC. We always sell things as cheaper, faster better. From where I sit technology continues to be more and more complicated. The average single user 15 years ago had two devices maybe, generally one. How many devices do they have now? Five, six, 10, 20? It's a massive number. That's added complexity." A conversation about moving to the cloud is also a good opportunity to discuss another change with customers that can benefit both the MSP and the customer. Sobel says that the broad market is really moving in the user-based billing direction. "There have been significant adaptions to the way people price. We're over the hump now where the majority, more than by device, are billing by user. I'm seeing much more billing by user than I'm seeing billing by device," he says. "Device-based billing has been kind of the hallmark of managed services. It needs to move to user-based billing," Bellini agrees. "The old model is, I am charging you for this Exchange server, this desktop computer. The way the world is going is, I'm charging you to keep Sally productive with all of her devices and with all of her applications regardless of where they might reside, whether they're in the cloud or on-premises." Things get more interesting when MSPs start looking at net-new types of opportunities around the cloud. Charles Weaver, CEO of the International Association of Cloud & Managed Service Providers, aka the MSPAlliance, points to alliance members making money with identity and access management. "We're seeing a lot of MSPs get into things like identity and access management, a service line that would have been really rare 10 to 15 years ago. But today with cloud that's a very hot growth sector," Weaver says. "If you have one of these born-in-the-cloud service providers, the majority of their offerings are resold public cloud applications. What's one of the best ways these companies can provide high-value services? They can manage the rights on customers accessing these public clouds -- password management, user management, access management, and blending in BYOD and device management." Kirill Bensonoff was working as a senior executive at Framingham, Mass.-based MSP ComputerSupport.com and saw another next-generation need. "We're seeing a lot of MSPs get into things like identity and access management, a service line that would have been really rare 10 to 15 years ago." "We were looking to expand our managed services offering and started looking toward becoming more of a cloud service provider, becoming a CSP from an MSP," Bensonoff said. The idea was to monitor the health, cost and spending on public cloud services like Microsoft Azure, AWS and Google Compute on behalf of customers. He felt it was an important area to get into. "It's not a matter of survival today, but I think it's a matter of survival in the coming years," Bensonoff says. Not finding a tool for public cloud monitoring oriented toward services providers, Bensonoff founded Unigma, which released its unified cloud monitoring platform for MSPs in mid-March. To predict the future of monitoring public cloud services for customers, Cohen actually looks to the past. "Roll back to the late-1990s. The definition of managed service provider was somebody who monitored your network. The few of us who entered into it got all busy telling everybody that we monitor every device using SNMP and we would report on what was going on," Cohen recalls. The reality was that few of those devices failed. An MSP's real job involved the leased lines people were using to guarantee themselves bandwidth: "Our great skillset was in knowing how to say the phrase ‘Public Service Commission' to a big service provider to get them to get it fixed." Similar opportunities exist now for savvy MSPs, Cohen says. "When you're getting everything from the cloud, it has an SLA. If an MSP is smart, they're monitoring all those services so when anything goes outside the SLA, they're making sure the customer gets the penalty payment. Because you can guarantee that the uptime report you get from the vendor every month exactly matches their invoice," he says. Another major opportunity for forward-looking MSPs in the cloud comes from integrating services that customers may not even know exist. "The successful MSPs of the future are going to be the ones who know how to integrate services, not just hardware and software. That's the great challenge of cloud. It's not to obtain the service, that's easy. If I'm going to get this service from here, and that one from over there, you have to know if they have the same security standards, protocols, etc.," Cohen says. "The big advantage of an MSP is that it's part of their business to keep themselves current. What services are available, how they are best configured, how they are best combined with others." As for where MSPs can recruit the talent they need for those types of integrations, Cohen suggests an unconventional source -- looking at conferences like Black Hat U.S. "They're not developers, they're not code cutters. They're protocol hounds. Anybody who is steeped in protocols, it's the logical place," he says. Those MSPs running small-scale, general-purpose datacenters to support customers might want to take a hard look at how the business is working. Cohen is typically blunt on the subject. "Anybody who is a small provider who has a rack in their office, and they're trying to sell cloud from there, they're done. Stick a fork in them," he says. The capabilities and the customers are getting too sophisticated. "You can't build a couple of racks in your basement and call yourself a service provider anymore. You've got to have several multiple redundant datacenters with instantaneous failover or you're not competing." "It's not a matter of survival today, but I think it's a matter of survival in the coming years." Sobel is more nuanced about those who have datacenters built out already. "The question there becomes about when they made their investment and how they built it out. If you've already invested and built, it's worth maintaining," he says. He's very direct for those who haven't built a datacenter yet. "I would waive that solution provider off aggressively who didn't own one now who came to me and said, 'I'm thinking about building a datacenter.' My statement would be, 'Run, run, run in the other direction.' I feel like that ship has sailed." At the same time, the MSPAlliance's Weaver says he's actually expecting to see more MSPs spin up datacenters (or co-location space). But the reason there is for a boutique offering, not for horizontal-type services. Advice from industry experts about hybrid cloud, on the other hand, is unequivocally positive. At the SMB level, Len DiCostanzo, senior vice president of Autotask Workplace Channels, says the ability to help customers switch back and forth between cloud and on-premises as needed makes MSPs extremely valuable. "You may be moving all your Microsoft into the cloud, but you've still got to back it up when you can't get to the cloud," DiCostanzo says. Weaver says private and hybrid cloud work is some of the most lucrative available for MSPs right now. "MSPs are taking legacy applications or developing applications themselves and putting them into a customer-owned or customer-controlled environment, and having the MSP manage it for the customer. That's where the money is," Weaver says. "The data I've seen is we still haven't seen that public cloud applications are outpacing private hosted cloud." Of MSPs making a go in the cloud, Software-as-a-Service resellers are numerous but private/hybrid cloud MSPs are doing better. "Numerically speaking, you've got a ton of people out there slinging Office 365 and Google Apps and they're doing quite well. [They're] making a living for themselves with some limitations on the margins that they can earn. Then you see the other MSPs who are blending those public cloud offerings with other services where they have far greater margin potential," Weaver says. It doesn't take a huge shop to make that business work, either, Weaver says. MSPs with fewer than 20 employees are managing private clouds for customers. "It's completely within the wheelhouse of technical expertise. These certainly are MSPs that are highly mature in their processes," he says. The next step for Microsoft-centric partners is to step up into the Azure platform for private and hybrid cloud work, Weaver suggests. "You could have both Azure and a private cloud environment working in synchronicity under the control of the MSP working on behalf of their client. Whether it's backup, hosting applications, you name it," says Weaver. "Something tells me Microsoft hasn't seen anything below the tip of the iceberg" in terms of MSPs taking advantage of Azure. While most observers seem to agree that the managed services opportunity around on-premises infrastructure is diminishing in inverse proportion to the rise of cloud, the consensus also seems to be that there are plenty of opportunities for alert MSPs to replace that business. "There's far more demand for managed services than there are qualified MSPs to deliver them," Weaver says. 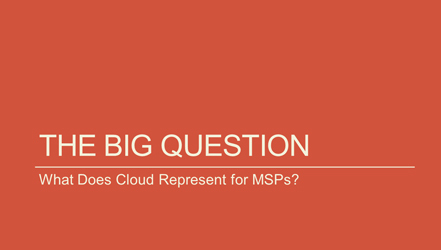 In some ways, the cloud makes being an MSP easier than ever, Cohen contends. "To be a services provider, it's not a difficult thing. You have to have the ability of a midsize IT department. If I've got a complement of skilled IT experts, a bunch of them sit in a remote control center with their headphones on and reach out and fix things." "In 2002, I was measuring success on device uptime. Now, I would be focused on productivity bumps. I would be very user-centric. I'd bundle together collections of productivity solutions, Office 365, and differentiate with other things around it -- putting together solutions they might not find on their own and try to help them find the best stuff. I'd add quarterly security training, because the biggest problem is users clicking on things. I'd measure success by customer's productivity and uptime."